Here’s a rather tragic tale. Joachim Giaver and Frederick Dinkelberg were two employees of D. H. Burnham & Co.–Giaver an engineer and Dinkelberg one of Burnham’s better classical stylists. Dinkelberg was generally credited with the interiors of the 1904 Railway Exchange and the 1907 Flatiron Building in New York. The two formed their own firm after Burnham’s death, when they were each well in to their 60s, and received their one and only skyscraper commission in 1924. The client was a syndicate interested in providing a central “exchange” for the city’s jewelry trade, much as the Railway Exchange had served as a central meeting and business point for that industry. Giaver and Dinkelberg responded with a tower announced at 500 feet, but that soon stretched to 547. The building’s massing was a radical step for skyscrapers under the 1923 zoning ordinance. Giaver and Dinkelberg set a tall tower atop the limited height of the lower block, but given the full quarter-block site on the new Wacker Drive, they set the tower atop the center of the site, where in earlier generations a light court would have provided illumination to the building’s center. Instead, the Jeweler’s wrapped a band of offices, retail space, and wholesale showrooms around a block of automobile parking, the first multi-story enclosed garage in the Loop. This was sold as a security feature to tenants, allowing them quick access to the safety of their automobiles when carrying precious items. True to Dinkelberg’s reputation as an academically correct classicist, the Jewelers’ was ornamented in encyclopaedic references to various Roman prototypes. 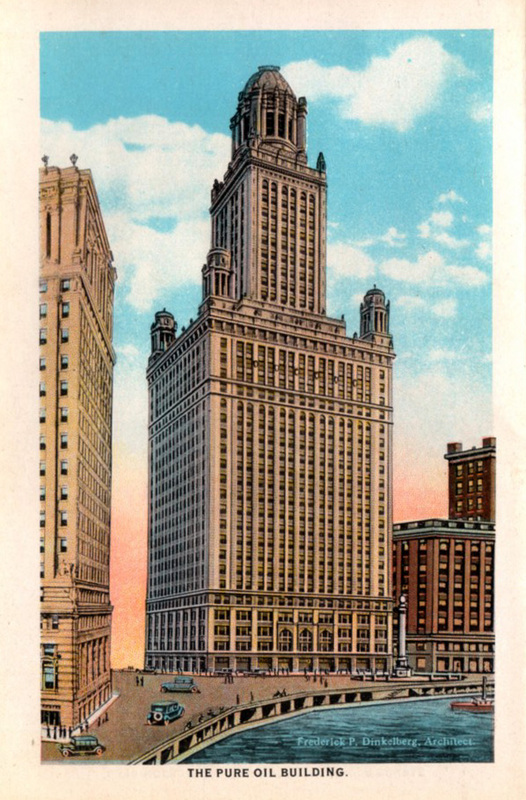 Four corner towers accented the limits of the 260-foot main block, while a dome at the top of the tower served as a crowning element on the skyline. With the tower pulled back from the street edge, the building’s setbacks featured panoramic views, and were used as observation decks by tenants and the public. As Wacker Drive was completed at around the same time in this area, the Jeweler’s was entirely in tune with its classical detailing and ornament. The Jewelry industry never migrated north from its center on Wabash, but the Jeweler’s was popular with commercial clients–Pure Oil moved in as the primary client, and the building was renamed for them shortly after the opening. Giaver and Dinkelberg designed no other large buildings. The depression shuttered their firm, and Dinkelberg’s heavy investments in utility stocks bankrupted him. Forced to give up his large home in Evanston, he died in a rented flat in February, 1935, penniless. His wife pleaded with local architects to take up a collection to pay for his funeral, which they did. Ten years later, Chicago architects did the same for her, chagrined that the designer of one of Chicago’s tallest, most visible buildings had come to such poverty. The Tribune reported yesterday that Bruce Graham, former partner with Skidmore, Owings, and Merrill and lead architect of the Sears and Hancock towers downtown, died at the age of 84. Franz Schulze referred to him as the “Burnham of his generation,” and that’s probably not far from true. Graham was a designer and administrator, a planner and a relentless publicist, all of which created as formidable a force in Chicago design and culture as Burnham was in his day. 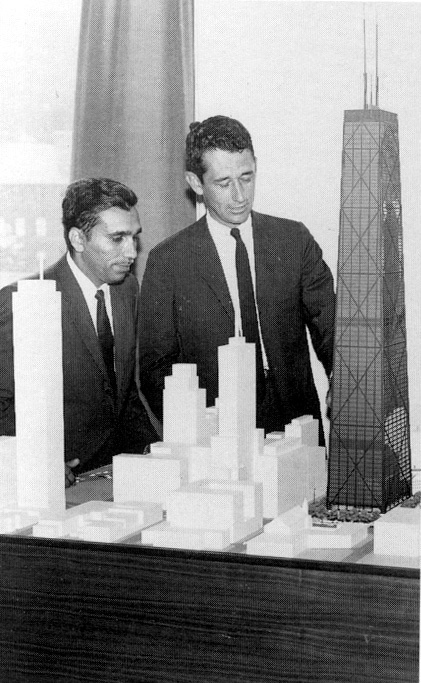 Graham was famously tough, and carried on a lifelong feud with other partners at SOM, but that quality also got things done, and the thorough honing of a single idea–expressed wind bracing at the Hancock, a spanning arch in his office block at Bishopsgate, or the relentlessness of the Sears Tower’s “bundled tubes” shown on its elevation–all made his buildings distinctive and successful. When he tried to tone things down, as with Sears’ infamous “lunchbox” entry in the mid-1980s, it was obvious that he was going against his instincts. I had exactly one encounter with Graham, as a young intern at SOM’s office in 1990. The highlight of the summer was an hour-long lunch with Graham and the rest of the intern class. He was in the process of retiring, and seemed to enjoy the back-and-forth with us. He took our questions, answered some pointed critiques of Sears, and told stories about his working relationship with Faz Khan. Then, when it was time to get back to work, one of my fellow interns asked one last question. What one thing, Mr. Graham, would make Chicago a better city? All of us craned forward, waiting to hear what the force behind the Museum Campus and innumerable master plans would say. A 3,000 foot skyscraper? A new stadium? Masterplan? Graham didn’t hesitate. “I’d slap a $&#$ five-dollar tax on every &*#$ gallon of gasoline sold in this city,” he said. Food for thought. You are currently viewing the archives for March, 2010 at architecturefarm.